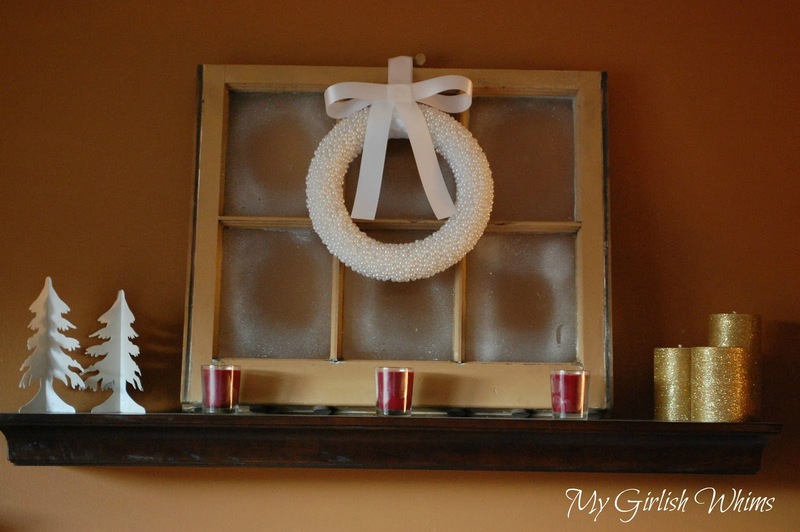 This winter pearl wreath I made for my family room HAS to be my favorite Christmas decor item this season! I started with a mini Styrofoam wreath form and two bags of plastic pearl beads from walmart (8mm). I ended up going to AC Moore for 4mm pearls and 6mm pearls as well to mix up the sizes. Since it did take forever I did not do the back of the wreath. It was important to me to make sure the whole front was covered. I've seen some pearly wreaths that are left sparse on the front and it just looks so unfinished to me! So I made sure the front was covered but that was good enough for me!! I used a hair dryer at the end to blow off all the little hot glue gun strings. Very helpful!! I knew I wanted to put this wreath on my window that my fall leaf wreath was on this fall. I thought it would be a nice touch though to winterize the window a bit with some frosted window panes!! I just used a snow spray from the dollar store. It will look a little harsh at first but it will fade to a more subtle effect in a day or so. I hung the wreath up on the window with some white ribbon...but hot glued a pretty little bow to add on as a decorative touch first. All attached and ready to go up on display!!! Here it is in my family room. The perfect touch for my "faux mantel" shelves. Come back tomorrow for details on the decor on this shelf and my other two floating shelves! Merry Christmas! Zuhah is a 100% free service to open your own web store to sell art pieces and craft products. I wasjust about to say I love that!, but I guess Thrifty Crafty Girl beat me to me, lol! That is so me! I love white, I find it is to pretty, feminine, and goes with anything! By the way, I'm curious how much all the pearls cost you in total, to make the front side of the wreath? So wonderful Rebecca! just love pearls, and it look so stunning on the window you have made! Thank you for all the parties and ideas througout the year, it has been such joy, thank you. Have merry christmas and hope it's going to be joyfull with your friends and family! You did a great job. The patience paid off! Found you on Liz Marie!